Based on family records listed in Ancestry.com, James Brown was born on 23 May 1806 in Abbey, Renfrewshire, to James Brown and Mary McKorkindale. On 21 January 1831 he married Mary Catherine Flynn, who was born in County Wicklow, Ireland, in 1807. The Old Parish Register for Abbey Parish, Renfrew, records that they were both of the parish and were married on 21 January 1831 by the Reverend Walter Blair, Paisley. David Brown, born in 1844, died in 1898. Andrew Brown, born in 1846, died in 1926. The voyage in the Blenheim terminated when that vessel anchored off Kaiwharawhara, and on landing there the Brown family were accommodated in a raupo whare provided for their use by the agent of the Kew Zealand Company. Shortly afterwards a removal was made to what is known as Alicetown, Lower Hutt, and at a later date to Belmont. The Brown family were the first settlers beyond the Silverstream-Taita Gorge — communication between these points being by means of a native track over the hills from Taita, across the stream in Stokes Valley, and again across the hills to where the Silverstream brickyards are now located. There was no way alongside the river on the eastern side, as the river ran close in to the hillsides there. DETOUR AT TAITA. Having acquired possession of a piece of land extending from the neighbourhood of the Upper Hutt Post Office eastward beyond the Borough Council offices Mr. Brown proceeded to settle upon his holding and, placing his worldly goods upon a light dray trekked eastward towards Upper Hutt. The hills of Taita and Silverstream were impassable for wheeled traffic and the vehicle was taken apart, the wheels taken across separately, and the body slung on poles carried by the pioneer, assisted by a couple of stalwart settlers (Messrs. Galloway, of Pahautanui, and M’Ewan, of Rangitikei). On arrival at the eastern side of the gorge the vehicle was reassembled, and the kindly neighbours returned to their homes then at Lower Hutt. On arrival at Upper Hutt Mr. Brown erected a slab whare for his family, and covered it with a sail-cloth for a roof. He conducted the first tavern in the district, which was designated “The Shepherd,” and later on reconstructed and improved it, when it acquired the name of the “Criterion Hotel,” in which the Duke of Edinburgh stayed the night on the occasion of his visit to see the beauties of the Hutt River and native bush at the “Maori Bank.” A photograph of the hotel can be seen now in the Borough Council Chamber at Upper Hutt. The building, until recently temporarily occupied by the local Bank of Australasia, was the “stables” of the Criterion Hotel, and replaced the original stables which had been destroyed by fire on the night of the Duke’s visit. It has the honour of being the first store in Upper Hutt. The original business settlement having been established in the neighbourhood of the Oddfellows’ Hall, Trentham. The Old Parish Register for Abbey, Renfrew, recorded that Sarah, daughter, legal, of James Brown, weaver, Cotton Street, and Mary Flynn was born on 5 March 1831 and registered on 31 March 1831. Sarah Brown was listed as a child of 9 when she boarded the Blenheim for New Zealand. Mary Wilson, born in 1850, died in 1905. James Wilson, born in 1852. William Henry Wilson, born in 1854, died in 1938, married Christine Charlotte Fagan in 1890. John Wilson, born in 1856, died in 1923. Elizabeth Wilson, born in 1858, died in 1921. Joseph James Wilson, born in 1861, died in 1935, married Catherine McTaggart in 1897. Alexander Francis Wilson, born in 1863, died in 1935, married Adelaide Sophia Worsfold in 1888. George Wilson, born in 1865, died in 1923, married Lydia Mary Riley in 1904. Annie Wilson, born in 1867, died in 1941, married James McLeod in 1892. David Bernard Wilson, born in 1869, died in 1960, married Fanny Louisa Wilson in 1895. Agnes Wilson, born in 1871, died in 1946. Sarah Jane Wilson, born in 1873, died in 1957. Emily Mary Wilson, born in 1875, died in 1946 (Sister Basil). JAMES WILSON: Mr. James Wilson, one of Upper Hutt’s early settlers, who for some years has resided in Rangitikei, died at Makino on Sunday last, being 83 years of age. Deceased had an eventful career. Bom in Ireland, he came 67 years ago to New Zealand with the 65th Regiment, and took part in Hone Heke’s war and several other campaigns. He afterwards settled at Upper Hutt, where he married a sister, of James Brown, sen, and Mrs. Alex Martin. While at Upper Hutt he acted as instructor to the local militia at the blockhouse in the rear of the Trentham post office. After farming at Upper Hutt for a number of years, he went to Makino, where he has resided for some thirty years past. Deceased had been ailing for the past five years. Mrs. Wilson, who is an invalid, survives her husband, with six sons and five daughters. The sons are Messrs. W. H. and J. (Feilding), J. J. (Christchurch), A. F. (Levin), G. E. (Auckland), and David (Wellington). Mrs. McLeod (Makino) is the eldest daughter, and the others are unmarried. James Brown was 7 when he emigrated to New Zealand on the Blenheim with his family. After living in the Lower and Upper Hutt Valley with his family, in 1852 James set off for the Australian goldfields, being joined by his brother George. They returned to the Hutt Valley by 1854 and began farming together. Of the 300 who came out in her only seven are now alive. One of these is Mr. James Brown, of Wellington (now 80 years of age), who lived at the Lower Hutt with his parents for seven years and then removed to the Upper Hutt, the family being the first settlers there. His brother (Mr. George Brown) and one of his sisters (Mrs. James Wilson), both of whom died 18 months ago, also came out in the Blenheim. In addition to Mr. James Brown, Mr. James Nicol (Masterton), Mrs. Miller (Carterton), Messrs. Donald Fraser and Cameron (Rangitikei), Mrs. A. Martin, sen. Upper Hutt), and Mr. Donald Cameron (Greytown], who were also passengers, are still alive. The company of the Blenheim immigrants, who landed here in 1841 suffered a further diminution yesterday by the death of Mr. James Brown. His father (Mr. James Brown, sen.) was one of the Port Nicholson settlers and lived for many years in the Hutt Valley, eventually settling at Upper Hutt. James Brown, the younger, took part in the early gold rushes, and was at Ballarat at the time of the riots. Finally he settled on the land, in partnership with his brothers George (since deceased) and Andrew. That was about 1854. The brothers experienced all the trials which confronted the early pioneers at a time when communication with other settlements was difficult, and the temper of the Natives was uncertain Mr. Brown retired from active work over a decade ago, and shortly afterwards came to reside in Wellington. Hence he was a well-known figure, especially amongst people who delighted to hear of the early history of the settlement of the province. Though 82 years of age, at the time of his death he was, till a few weeks ago, remarkably active, both physically and mentally. His reminiscences were always interesting. The illness which carried him off came upon him about three weeks ago. He was never married, and his nearest surviving relatives are Mr. Andrew Brown (a brother), and Mrs. Martin (a sister, and one of the Blenheim immigrants), both of whom reside at Upper Hutt. George Brown was 5 when he sailed to Wellington on the Blenheim. After living in the Hutt valley with his parents he went off in 1853 to join his brother on the goldfields in Australia, but returned to the Hutt. George Brown married Jemima Hunter on 9 May 1875, but they appear to have had no children. Jemima died in 1898. MR. GEORGE BROWN, J.P.: HUTT PIONEER. There passed away at 1 p.m. yesterday another of Wellington’s pioneers, in the person of Mr. George Brown, J. P., of Buller Street, who has been a resident of the district for the past seventy-two years. He was born in Paisley, Scotland, in 1835, and sailed from the Clyde with his parents in the ship Blenheim, when five years of age, arriving here on the eve of the same year. With his parents, he resided in the Hutt Valley, working on the farm until May, 1853, when he went to join his brother, Mr. James Brown (also of Wellington), who a year previously had gone away to try his luck on the Victorian goldfields. The two brothers went through all the trials and hardships of life on the goldfields for five years, both in Australia and Otago. 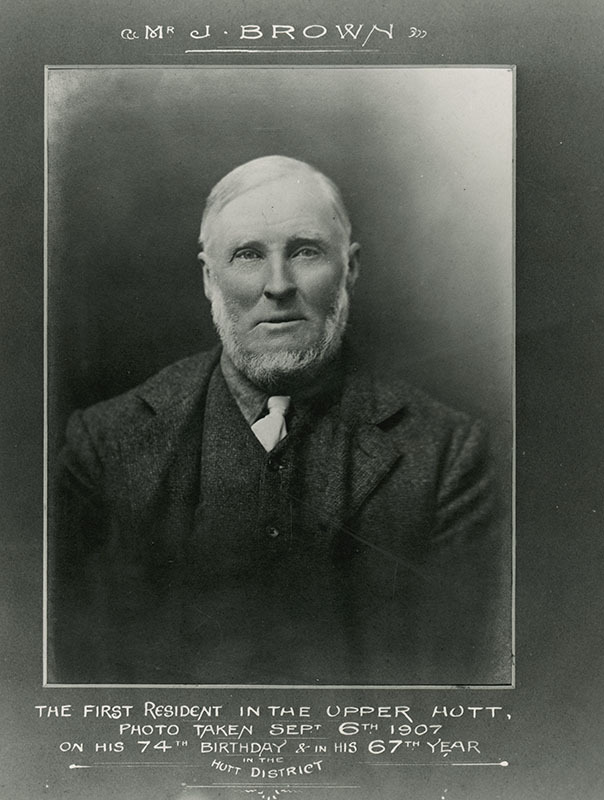 Finally the deceased returned to the Upper Hutt district, and turned his energies to farming, in which occupation he continued up till about six years ago, when he retired, and came to live in town. He always took an interest in public affairs, and represented the Mungaroa Riding on the Hutt County Council for twelve years, finally retiring on account of ill-health. His father, the late Mr. James Brown, owned and built the first hotel in the Upper Hutt, “The Shepherd’s Inn” (later known as The Criterion, but since demolished). Deceased was a member of the Hutt Licensing Committee, and took keen interest generally in advancing the district’s welfare. He was a valued member of tho S.P.C.A. up to the time of his death, and as a Justice of the Peace rendered good service to his district over a very long period. Like his father, he was one of the militiamen called out to meet the Maoris at Boulcott’s Farm, Lower Hutt, upon the historic occasion when Bugler Allen, “the boy hero”, died under such tragic circumstances, in giving a timely alarm to the settlers in the vicinity. Deceased, whose widow survives him, leaves numerous relatives and a big host of friends in this district. Deceased was born at Paisley, Scotland, in the year 1835, and left the Clyde, for New Zealand, on September 6, 1840, in the ship “Blenheim,” with his parents and a large company of other Scottish settlers, arriving at Wellington on Christmas Eve 1840. The family settled at the Hutt, and in 1853, he left for Australia, en route for the Victorian goldfields, to join his elder brother James, who had gone across the year previous. The two brothers remained on the goldfields for some five years, and took a prominent part in all the meetings which culminated in what are known in Australian history as the “Ballarat Riots.” Returning to New Zealand, he, with his brother David, and his, brother-in-law, James Wilson, went to the Otago Goldfields in 1860, and returned to Upper Hutt a couple of years later, where he resided with the other members of the family. From 1860 to 1870 he served in the Militia, which had been called out owing to the Maori troubles. In 1870, on the recommendation of the late Hon. Sir P. A. Buckley, Mr. G. Brown was appointed a Justice of the Peace. The deceased gentleman was married in 1872 to Jemima, the youngest daughter of the late Robert Hunter of Lower Hutt. For twelve years Mr. Brown represented the Mangaroa riding on the Hutt County Council, when he retired owing to failing health. As an active member of the committee of the Wellington Society for the Prevention of Cruelty to Animals, Mr. Brown, after he took up his abode in the city, rendered valuable aid to Inspector Seed, who speaks enthusiastically of his work for the Society, The deceased gentleman, on all occasions took a lively part in local and general politics, he, in conjunction with his brother James, has been a generous friend to the Sisters of Mercy, and has proved an ardent supporter of the Catholic Church locally. Elizabeth Brown was only 1½ when she travelled on the Blenheim to New Zealand. Jane Martin, born in 1855, died in 1942, married John Golder in 1877. James Martin, born in 1857, died in 1945. William Henry Martin, born in 1860, died in 1957. Isabella Martin, born in 1862, died in 1945, married Patrick McGrath in 1905. Mary Elizabeth Martin, born in 1864, died in 1904. Thomas Martin, born in 1867, died in 1884. Elizabeth Martin, born in 1869, died in 1929, married Timothy Moynihan in 1907. Helen Martin, born in 1872, died in 1960. Alexander Gordon Martin, born in 1874, died in 1910. Emma Martin, born in 1876, died in 1948, married John Larmer in 1909. David Martin, born in 1879, died in 1946. John Alexander Martin, born in 1882, died in 1955. Alexander Gordon Martin died on 27 May 1902 aged 68. By the death of Mrs. Elizabeth Martin on Friday, 6th December, 1929 Upper Hutt lost the last original settler of a hardy pioneering Scots family. Born at Paisley, Scotland, 91 years ago, she left the Clyde in September, 1840, with her parents, Mr. and Mrs. James Brown, and other members of the family, arriving in Port Nicholson on 27th December, 1840. MAORI TROUBLES—THE STOCKADE. Mrs. Martin had two brothers (James and George) and one sister, Sarah (Mrs. Wilson), older than herself, and two brothers, David and Andrew, born in New Zealand, all of whom predeceased her. The deceased lady, though sorely troubled with rheumatism in later life, retained all her faculties until a few hours before her death, and could speak clearly and with wonderful detail upon historical and domestic matters of the Hutt Valley from the sea eastward. She gave vivid pictures of the many hardships and anxieties of the pioneers; of the floods of the Hutt River—half-a-dozen a year—when the water ran through their house in the Lower Valley; of the first bridge over the Hutt River; of the Maori troubles and the early morning attack on Boulcott’s Farm outpost, when Bugler Allen was killed while sounding the alarm; of the building of the stockade at Trentham near what is now known as “Quinn’s Post” Hotel; the local bushfire fights, and the several sawmilling industries of the district— three mills operating at the same time between Whiteman’s Valley road and the Upper Hutt Catholic Church on the main road frontage. Mrs. Martin was of a kindly nature and ever willing to help anyone in need. She was a keen gardener, and her residence was surrounded with choice plants and flowers, and was one of the beauty spots of the Upper Hutt. She was the first lady elector to record a vote at a Parliamentary election in the upper end of the Hutt Valley. Her husband, Mr. Alexander Martin, a native of Kirkcudbright, Scotland, died 27 years ago. Of her family of twelve there are nine still living. The sons are James, of Upper Hutt, for many years connected with the New Zealand Railways; William, of New Plymouth, farmer; David, of Wanganui, of the White Star Motor Service; and John, of Hastings, fruit expert; and the daughters are Jane (Mrs. Golder), of Upper Hutt; Isabel (Mrs. M’Grath), Elizabeth (Mrs. Monihan), of Wellington; Emma (Mrs. Larmer) and Helen, of Upper Hutt. There are 42 grandchildren and 53 great-grandchildren. I read the article about the Blenheim passengers in the letters to the editor (Taranaki Daily News) and have spent the last hour reading about the Brown family. My husband – descendant of James & Mary Brown – attended the Brown family reunion in 1990 and are keen to join the 175 year celebration. Thanks for all the work done on this. Hi Gayle and Selwyn, we’ll look forward to your participation. Email your contact details to me at blenheim175@gmail.com so we can keep you informed.